The Droga chocolates in this gift are filled with caramel, but not just any caramel - instead of being made with sugar or corn syrup, this sweet filling is made from pure, raw honey. The taste is unbelievably sweet and dreamy, your favorite honey-lover won't want to share! We paired this box with luscious chocolate-covered honeycomb, French lavender honey drops and a bottle of Mike's Hot Honey, a chili-infused honey to make that perfect sweet and slowly-building heat. We love it on fried chicken and pizza, and your recipient will love experimenting with this delicious creation. Bottle of Mike's Hot Honey. Mileeven Irish Cream Liqueur Honey. Droga Money on Honey Chocolates. Measures 10" x 10" x 4". The Honey Bee Gift Crate is a hand delivered gift. These gifts are delivered by one of our local design centers located throughout the United States and Canada. Same day delivery is available for most gifts when ordered before the cutoff time. The cutoff time for The Honey Bee Gift Crate is in the recipient's time zone. Buttermilk Artisan Confectionary Chocolate HoneycombOur Cornish honeycomb is made with real honey and is light, airy and crunchy, with an intense dark toffee flavour that's covered in delicious creamy milk chocolate. Honeycomb heaven! Droga Dark Chocolate French Sea Salt Wildflower Honey CaramelsA uniquely delicious, clean caramel treat made from wildflower honey, fresh cream and real butter. Make a bee-line for this sweet snack and see what the buzz is all about. Money on Honey Dark Chocolate Toasted Coconut Almond CaramelsToasted coconut and freshly roasted almonds, caramel made from honey instead of corn syrup, and Fair Trade Certified premium dark chocolate. Even though you should, you won't want to share. 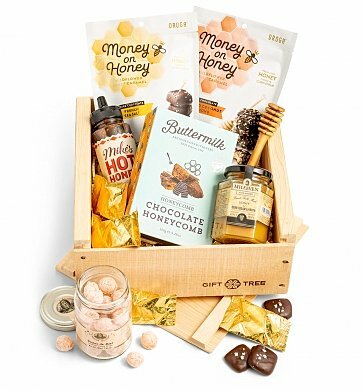 Chocolate covered honeycomb, chili-infused honey and more... this sweet gift crate is all things honey.